Domino’s And Ford Developed Autonomous Driving Cars For Delivery! 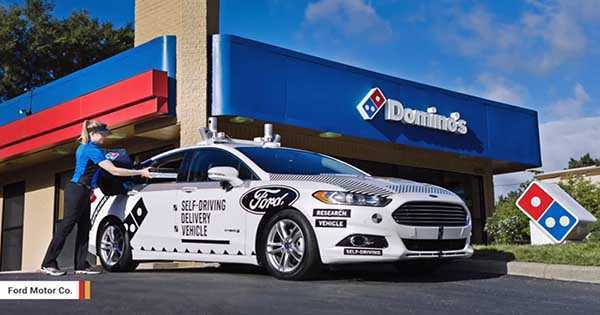 Domino’s & Ford Developed Autonomous Driving Cars For Delivery! The Ford Motor Company and Domino’s Pizza stated that they are exploring using autonomous driving cars for pizza delivery. The joint research is going to be made in Ann Arbor. This city in Michigan is actually the home of Domino`s Pizza. Ford headquarters is based pretty close to the home of Domino`s Pizza, around 30 miles west. Self-driving technology is still in the making and completely developed. However, ultimately, autonomous cars must improve our lives. Pizza delivery is seemingly just a mundane business. If Domino`s Pizza and Ford manage to pull this off we might get the most valuable measure of this technology`s success. This alliance between Domino`s and Ford underscores something that might keep happening in the automotive industry and beyond – partnerships. The world constantly tries to integrate automation and technology. That said, various industries will constantly search and find very creative ways to join forces. The automotive industry comes as one of the biggest and most important industry in the world. Having said this, expect to see various companies within this industry continuing to look outside of their field for consumers research. It looks like Ford and Domino`s will deliver pizzas in Ann Arbor to customers selected randomly. The autonomous driving cars used for this bold delivery plan will be the Ford Fusion Hybrid. This car is fully equipped with self-driving technology. However, at the beginning, these delivery vehicles will be operated by human drivers. The customers can track their delivery via GPS. Customers will also get SMS on how to take their pizzas when the vehicle arrives. Love Domino`s pizza? Read more fun facts about the chain!